Turn your party guests into heroes in a half shell with these awesome 30 Ninja Turtle Party Ideas! 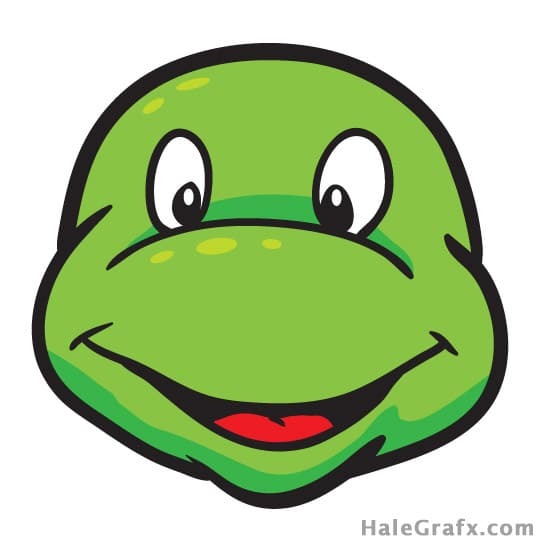 The Teenage Mutant Ninja Turtles or TMNT is a group of four teenage mutant turtles who were named after the great Italian artists of the Renaissance period namely Leonardo, Donatello, Michelangelo, and Raphael. They live in a sewer together with their sensei, Splinter (a rat mutant). Together, they fight crime and take on the bad guys whilst trying to remain hidden from society. Cool. huh? Cowabunga Dude! You can throw a totally tubular ninja turtle party with these fun and creative kids birthday party ideas such as Ninja Turtle cake ideas, Ninja Turtle decorations, Ninja Turtle birthday party games, and all the awesome and cool ideas to make your birthday party a success! These 30 Teenage Mutant Ninja Turtle Party Ideas will shell-shock your guests! So stick around and give your party some “turtle power” with these unique ideas for your child’s birthday! Ninja Turtle Party #1: What’s a birthday party without balloons, right? 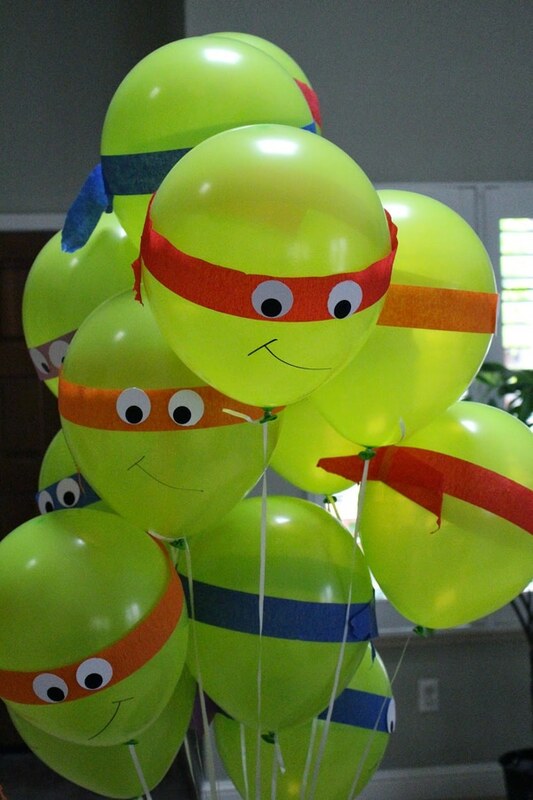 Check out these cool DIY Teenage Mutant Ninja Turtle Balloons by Crafty Mama. All you need are some craft papers, a black pen, and tape then voila! Ninja turtles balloons coming right up! 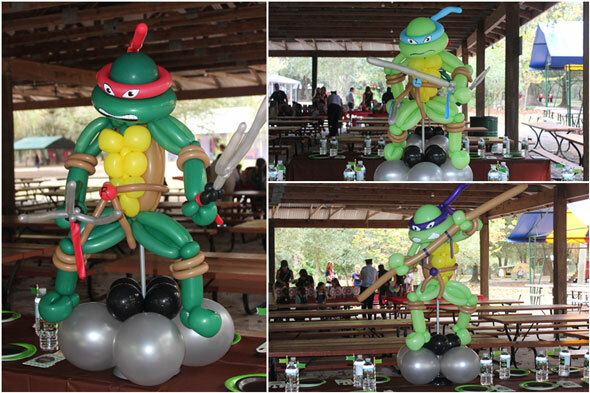 Ninja Turtle Party #2: Take up your birthday decorations a notch with these awesome Ninja Turtle Balloons. There’s no doubt about it, your child’s guests are sure to love these! They might even take them home! Ninja Turtle Party #3: What’s a Ninja Turtle birthday party without a cake and some desserts? 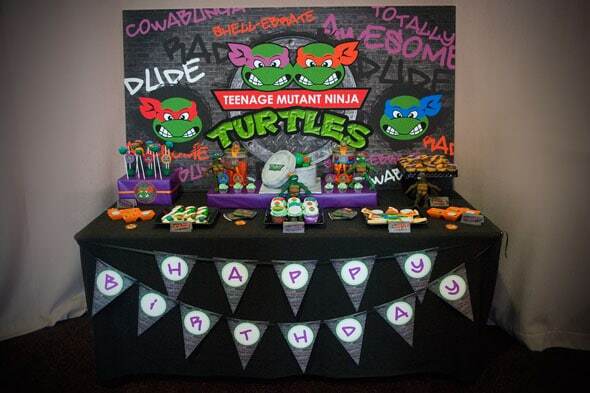 Come check out this Teenage Mutant Ninja Turtle dessert table from Kiss With Style via Pretty My Party. From cupcakes to cake pops, it’s loaded with all kinds of goodies that will keep your guests coming back for more. Ninja Turtle Party #4: If you’ve been wanting to make some TMNT crafts, add this oh so fun DIY Ninja Turtle Banner by Dolled Up Design via Moms & Munchkins to your list. It’s ridiculously easy. You can even enlist your kids to help you make them. 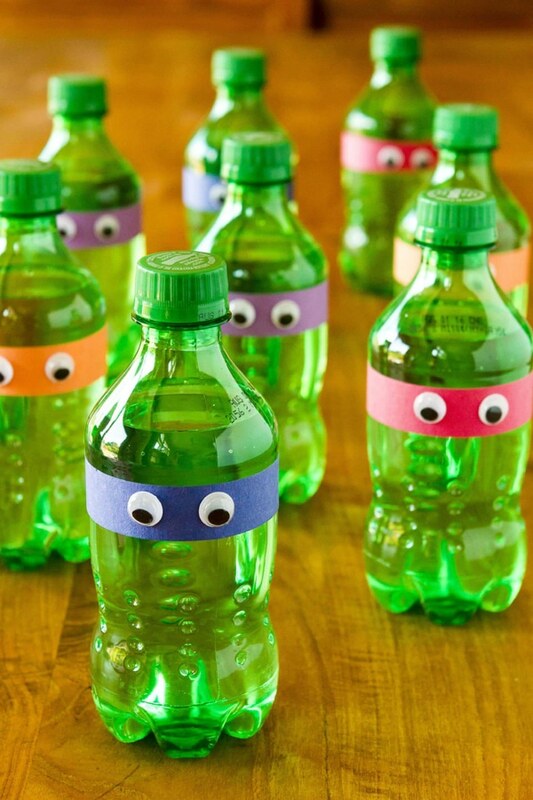 Ninja Turtle Party #5: Now these DIY Ninja Turtle Soda Bottles from Deal Seeking Mom are a must! They’re a fun way to dress up your drinks and they’re super easy to make too! Ninja Turtle Party #6: Every Teenage Mutant Ninja Turtle has a mask and so should your guests! Besides, what’s a party without a costume? 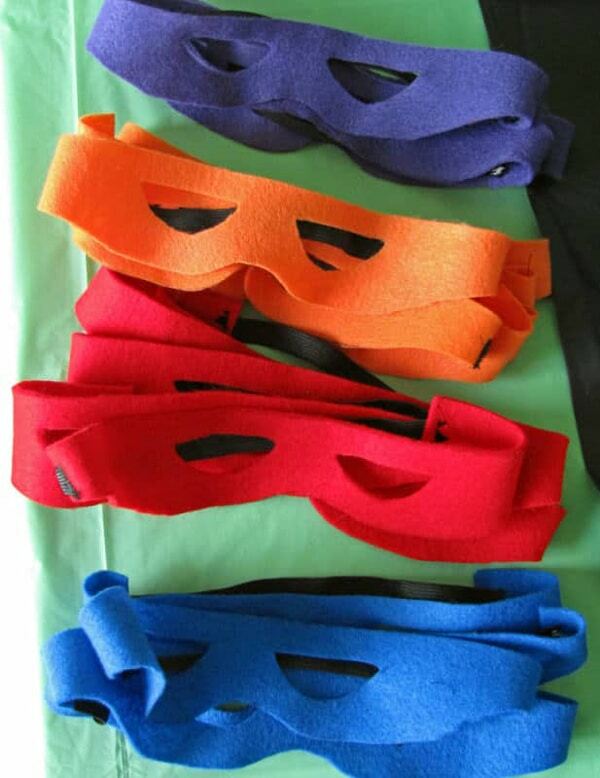 These TMNT Felt Masks from Craving Some Creativity can also serve as your giveaways. Kids will definitely love these! 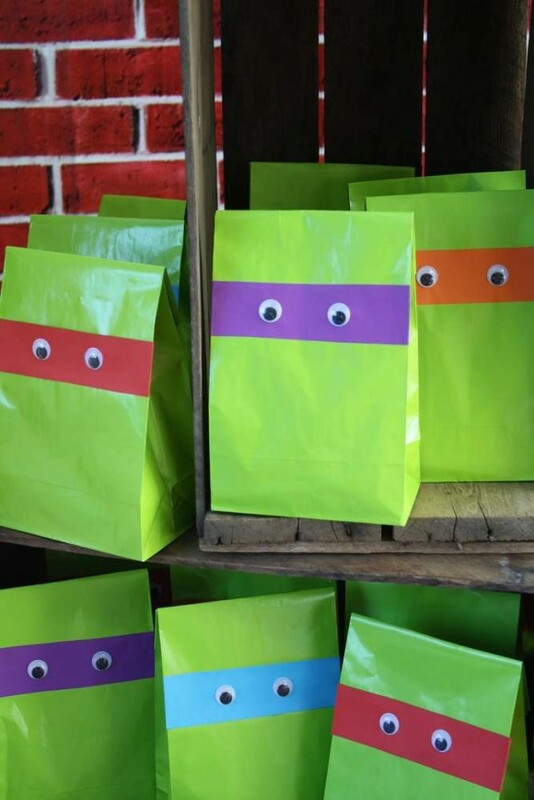 Ninja Turtle Party #7: Need more DIY party ideas? There’s nothing better than some fun games at a birthday party. Come check out this Pin the Mask Party Game with Free Printable from HaleGrafx. The kids will have a blast trying to put the mask on the turtle blindfolded. 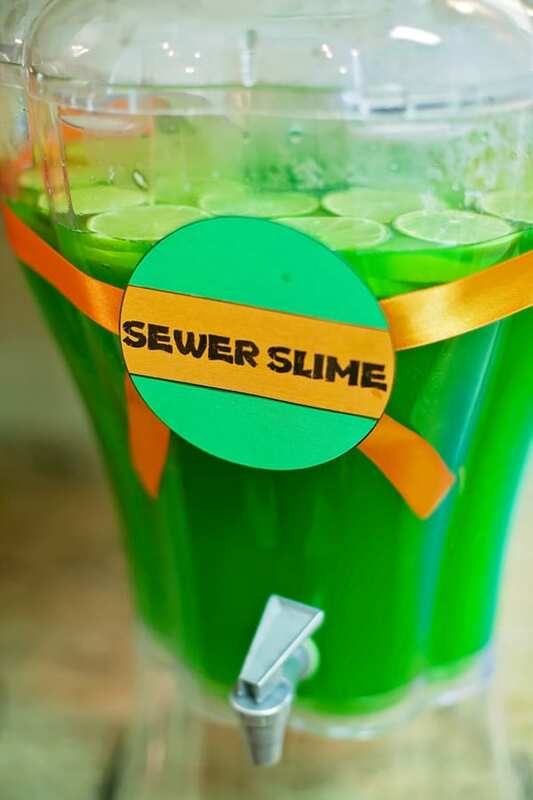 Ninja Turtle Party #8: Make your kid’s birthday party extra fun with this thirst-quenching Sewer Slime Party Drink via Project Nursery. We’re telling you, it’s gonna be a big hit! Ninja Turtle Party #9: What’s a turtle without a shell, right? 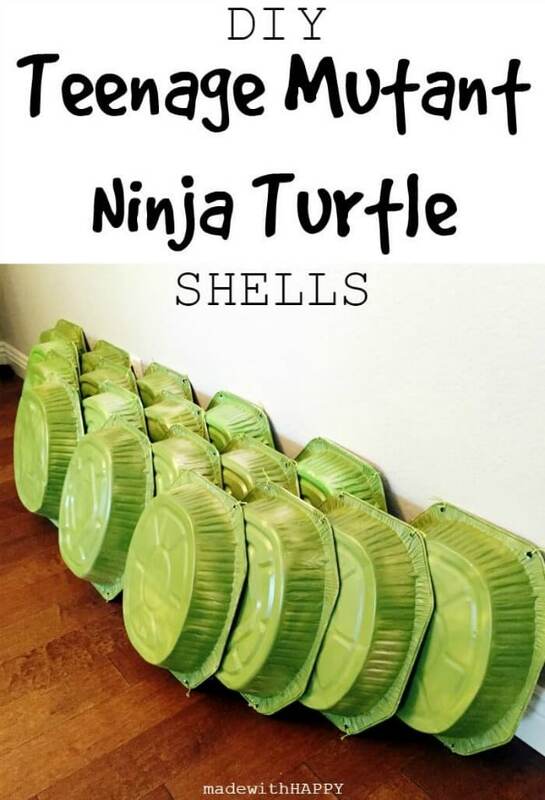 The kids will have a fantastic time using these DIY Teenage Mutant Ninja Turtle Shells from Made With Happy. Just image the cute photo of all the kids dressed up in these! 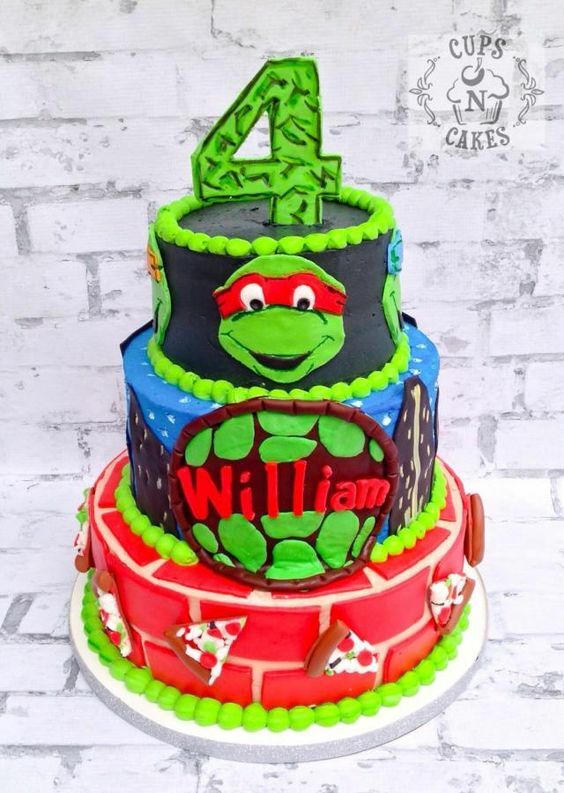 Ninja Turtle Party #10: This amazing Ninja Turtle Birthday Cake by White Craft Cakes via Cake Central will make a great addition to your dessert table. 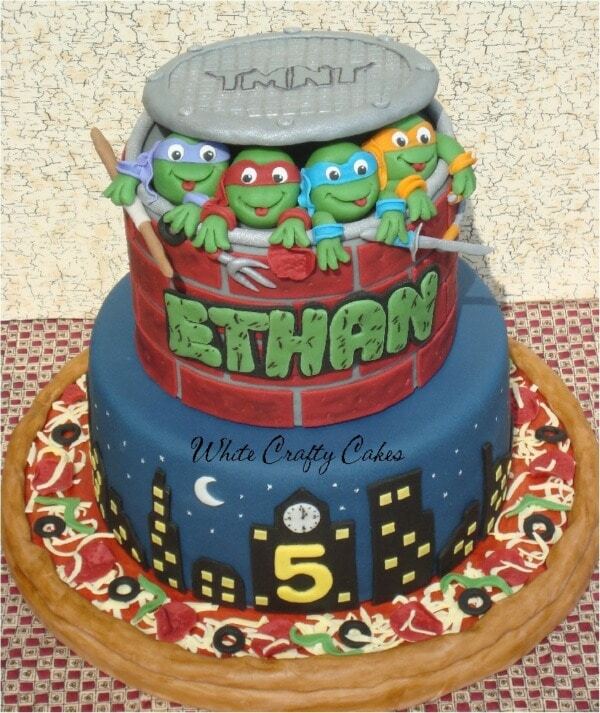 We love how each layer of the cake is something different to represent the Ninja Turtle theme! So cool! Ninja Turtle Party #11: This adorable Ninja Turtle Face Cake from I Heart Baking is sure to make the birthday celebrant happy! It looks easy enough for any parent to make and the kids will love it. Ninja Turtle Party #12: Looking for more food ideas? 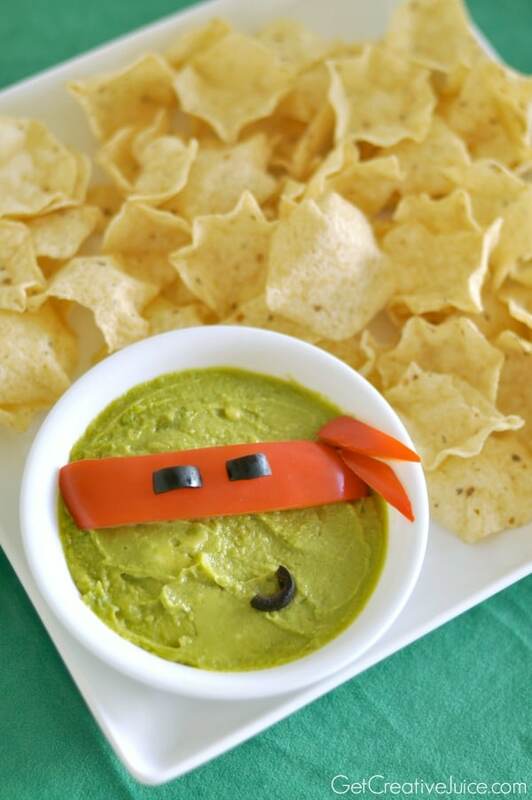 Try this delightful yet nutritious Ninja Turtle Guac and Chips Appetizer from Creative Juice. Who says you can’t get creative with the party food?! Creativity doesn’t stop at the party decorations! Ninja Turtle Party #13: These adorable Teenage Mutant Ninja Turtle DIY Favor Bags via Catch My Party are super easy to make. And they’re easy on the pocket, too. Just strap some colored paper and googly eyes to green paper bags and they’re ready to go! 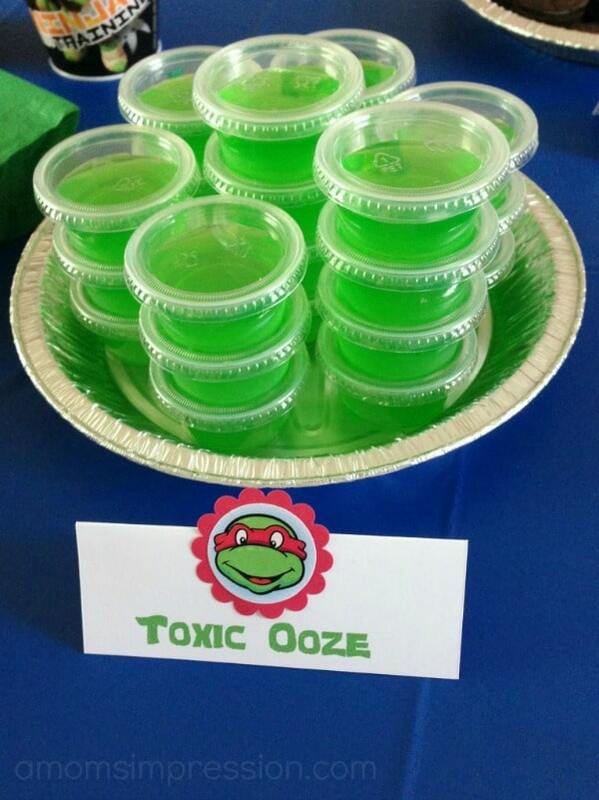 Ninja Turtle Party #14: Add this delightful Ninja Turtle Toxic Ooze Jello Treat from A Mom’s Impression to your dessert table and see the kids line up for more! Ninja Turtle Party #15: Looking for a healthy alternative? 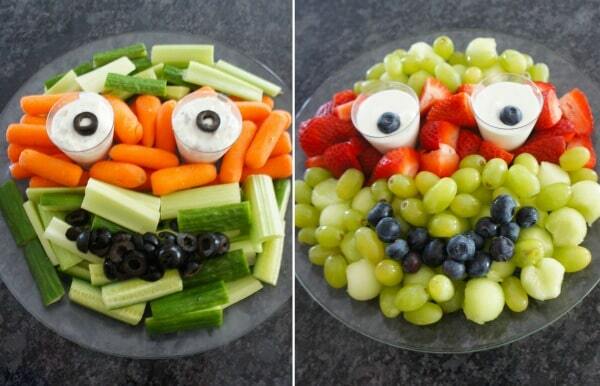 Try these Ninja Turtle Fruit and Veggie Trays from Dolled Up Design. Parents will love you for it! Plus, it’s super quick and easy to prepare. All you need are some cut-up fruits, veggies, dips, and you’re all set. 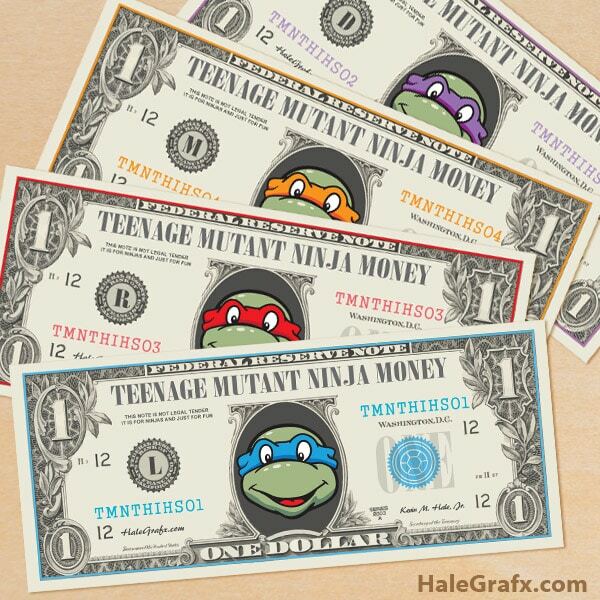 Ninja Turtle Party #16: This fun and free Printable Ninja Turtle Money from HaleGrafx would make a great addition to your TMNT party. The kids will think it’s super cool. 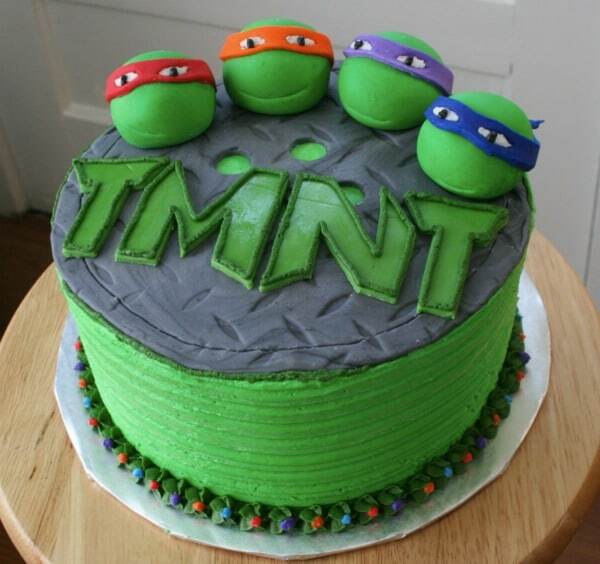 Ninja Turtle Party #17: We’re loving this yummy Green Ninja Turtle Cake from Jimmy Cakes. Your birthday dude or dudette is sure to have lots of fun blowing the candles out on this one. 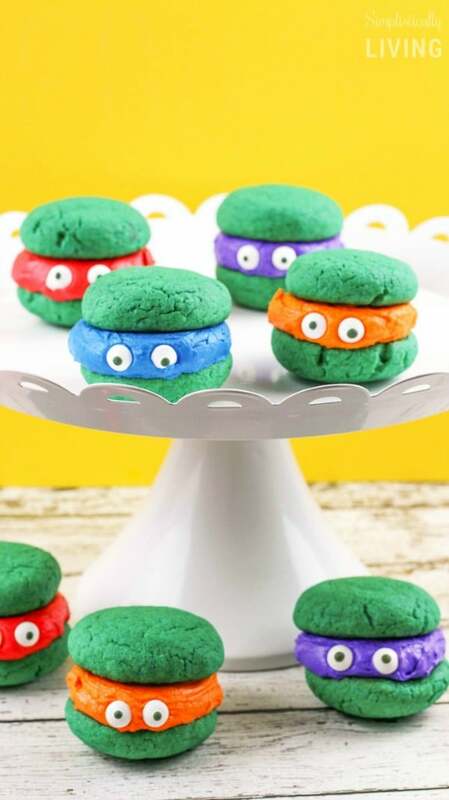 Ninja Turtle Party #18: Check out these adorable Ninja Turtle Whoopie Pies from Simplistically Living. To create these goodies, just click on the link and get the instructions. So gnarly! Ninja Turtle Party #19: Ooh! Just look at these Ninja Turtle Cookies from Cookie Connection. 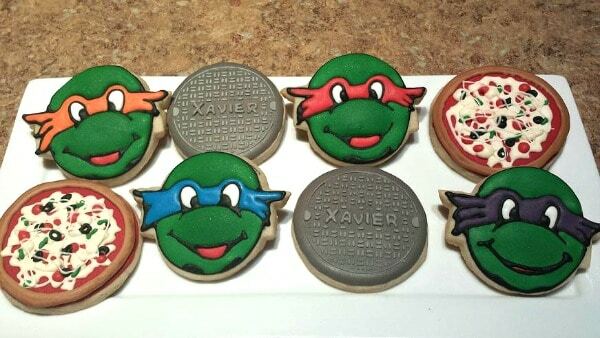 These would make your Teenage Mutant Ninja Turtle birthday party complete! 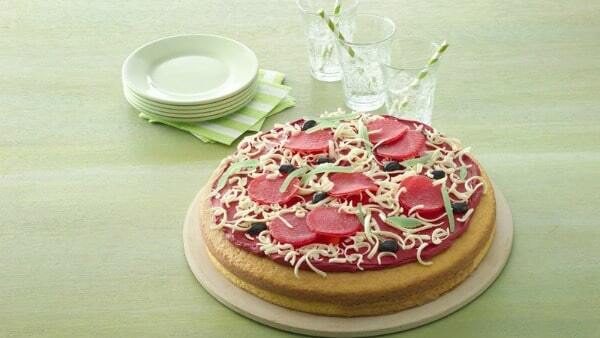 Ninja Turtle Party #20: If you want to know how to make a Pizza Cake, try this recipe by Betty Crocker. Your guests would be so stoked to grab a slice! 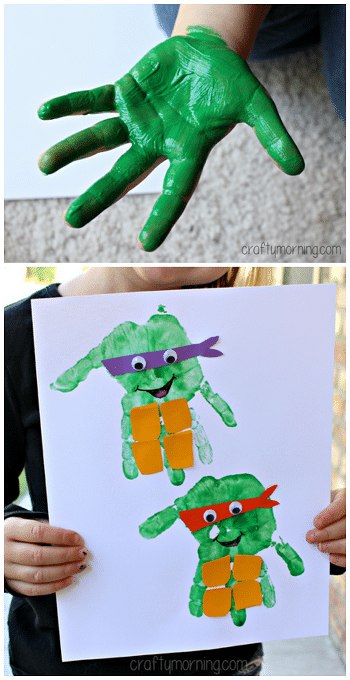 Ninja Turtle Party #21: Get crafty with this Ninja Turtle Craft Activity by Crafty Morning. 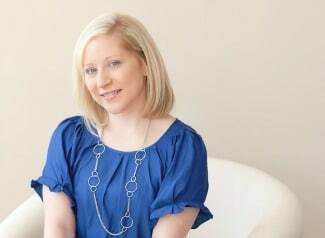 Have a fun activity station set up at the party for the kids to show off their creativity. Ninja Turtle Party #22: Kids will love playing with this! 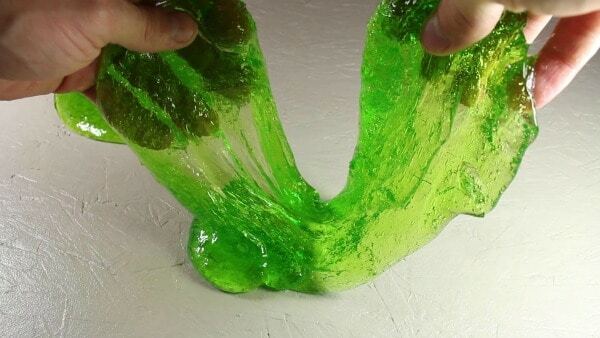 Check out how to make Ninja Turtle Ooze Slime with Wonder How To. You can even offer this as a party favor. For more awesome ideas, check out these fun slime recipes. 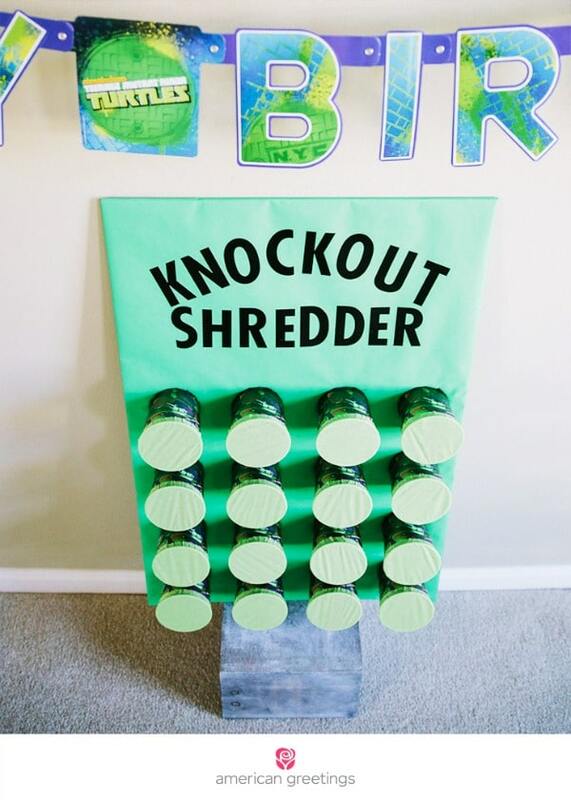 Ninja Turtle Party #23: Keep your guests busy with this Knock Out Shredder TMNT Party Game by Cardstore. The kids will have a blast seeing what prizes await them by knocking out the circles. Ninja Turtle Party #24: This fantastic three-tiered Ninja Turtle Birthday Cake is the perfect thing to add to your party. Imagine this cake on your dessert table surrounded by all of your other amazing desserts! 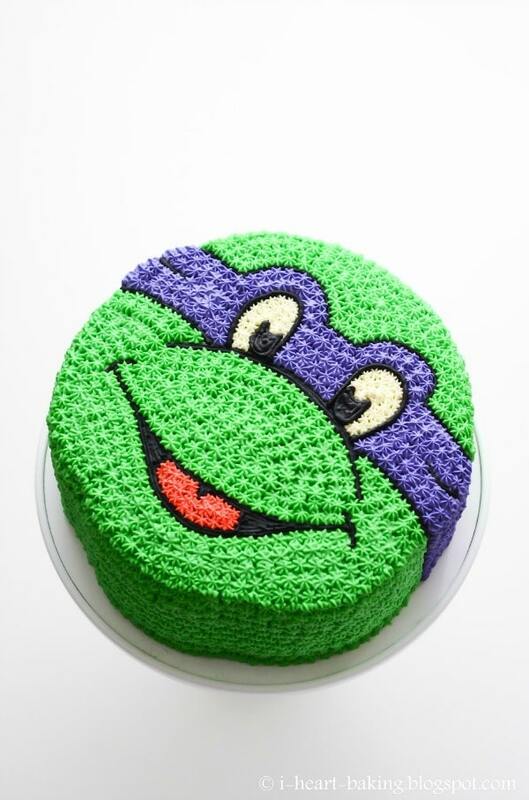 Ninja Turtle Party #25: Looking for an easy-peasy dessert? 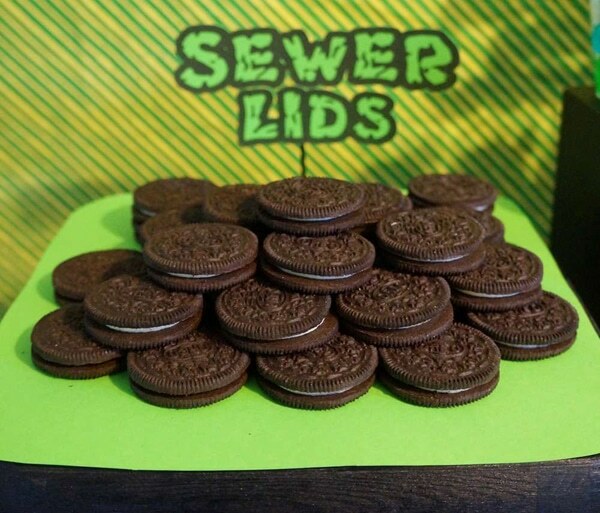 Try these Ninja Turtle Sewer Lid Oreos! Just serve ’em up and add a “sewer lids” label for an easy yet creative themed treat! 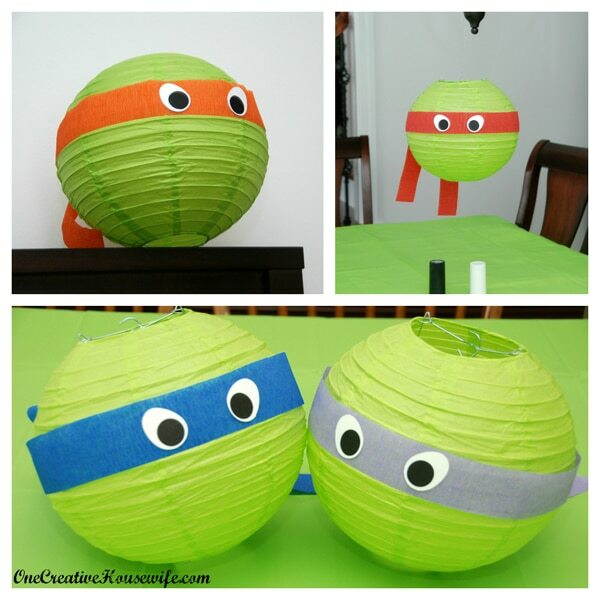 Ninja Turtle Party #26: If you’re looking for some eye-catching decorations, try these Ninja Turtle Hanging Lanterns. They’re easy to make and will liven up your party venue. 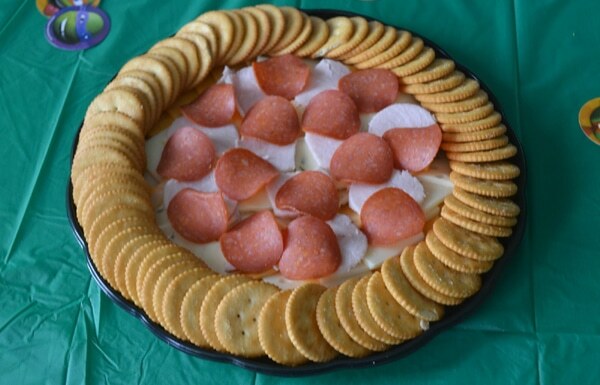 Ninja Turtle Party #27: We’re loving this clever Pizza Inspired Cheese and Cracker Tray. It would make a great centerpiece for your party tables. 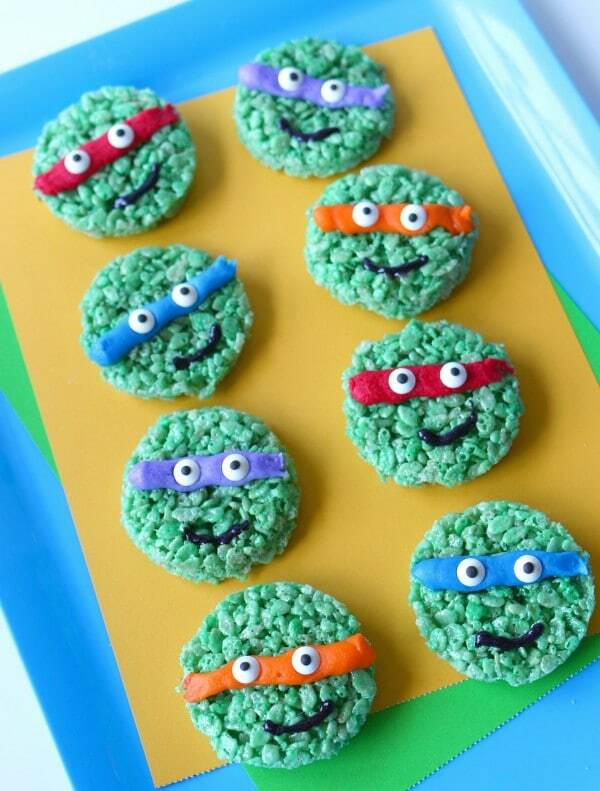 Ninja Turtle Party #28: How cute are these Ninja Turtle Rice Krispie Treats? They’re quite easy to make, too! The kids will absolutely love them. You can even wrap them individually for a fun take-home treat after the party! 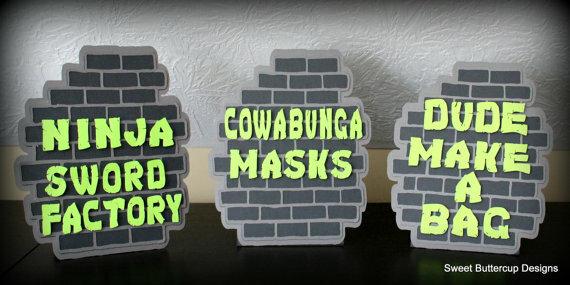 Ninja Turtle Party #29: Add these cool Brick Wall Table Signs to your decorations! How cool are these? 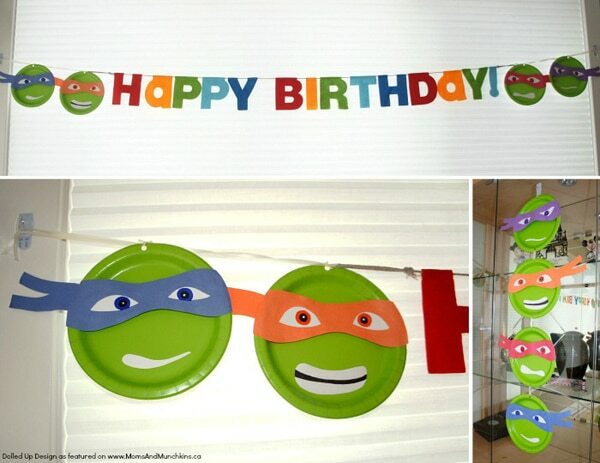 They are perfect for the ultimate TMNT party! Ninja Turtle Party #30: How delightful is this Ninja Turtle Chalkboard Sign? It would make a perfect keepsake as well. 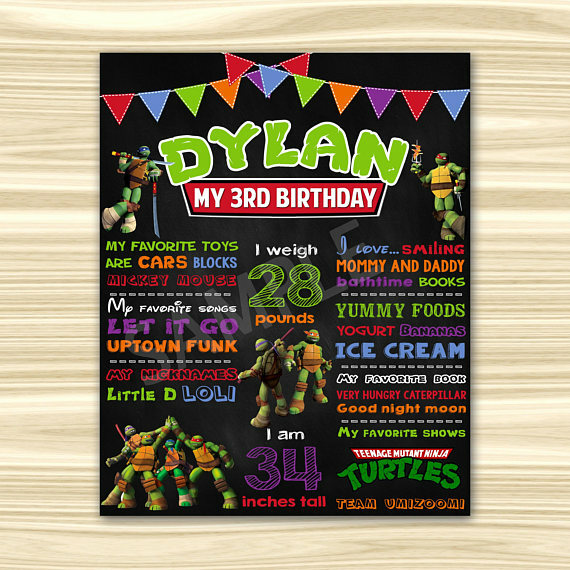 We love how this sign shows all of the birthday boy’s favorites! Bonus! 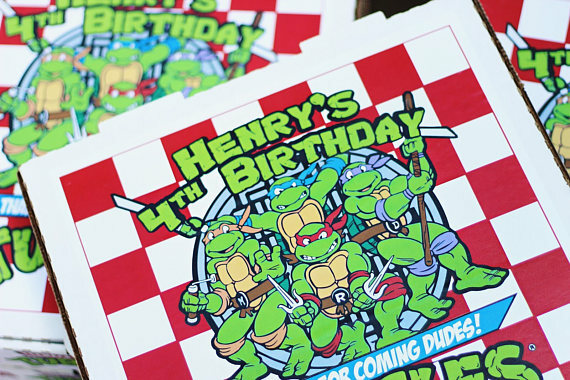 Ninja Turtle Party #31: Check out these clever Ninja Turtle Printable Labels and Pizza Boxes! You can also get similar designs from your local party suppliers. Which of these Ninja Turtle Party Ideas are your favorites? Let us know which ones you will be doing for your party in the comments below!